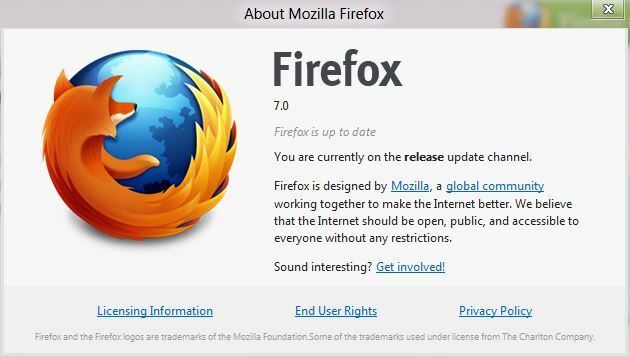 Mozilla Firefox is one of the most widely used web browser and today Mozilla pushed out the version 7 officially for Windows, Mac and Linux Operating systems.Mozilla claims that the developers already fixed the memory issues on Mozilla Firefox 7 and it is now ready to use. Mozilla also claims that the new Firefox will be 50% faster than any other versions and it will use only 50% of the memory. Some of the other major changes include the improved graphical performance and hardware acceleration. New tools in Firefox make it easier for developers to build snappy Web experiences for users. A new version of hardware-accelerated Canvas speeds up HTML5 animations and games in Firefox. This allows developers to build more compelling and interactive Web experiences like Angry Birds or Runfield. Firefox now supports the W3C navigation timing spec API so developers can measure page load time and website navigation against bandwidth speed, website traffic and other factors. This API allows developers to test user experiences remotely and easily and quickly optimize websites and Web apps for different types of users. Download Mozilla Firefox 7 For Windows from here. Download Mozilla Firefox 7 For Mac from here.